Some outdoor sites hold their value for visitors because of their beautiful scenery or challenging hikes. Others keep wildlife observers happy, or provide occasions for multi-season exploring. 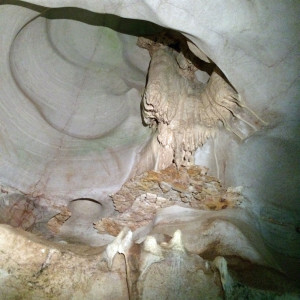 Longhorn Cavern State Park in Texas has me coming back for its stories. Last time I visited, I went on a spelunking tour of the cave, spending three hours crawling through narrow, muddy passages that led into beautiful spaces. This Saturday, I met up with the lovely author of Seeking Misadventure to check out the walking tour. We were accompanied by a much bigger group than before, considering it started later than the crack of dawn, was family-friendly and much less strenuous. Our tour guide handled our large number with finesse. Rather than focusing on navigation and caving techniques, our guide told stories at nearly every stop. And that's precisely what made this tour so special. 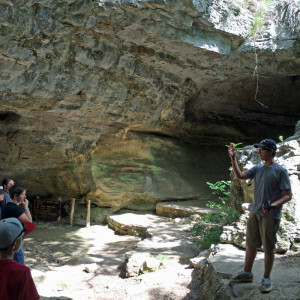 At Crystal City, we learned about how the CCC members who cleaned out the cave found what they hoped were diamonds embedded in the cavern walls. When they brought them to the surface, they realized they hadn't discovered the end to their Depression-era woes. 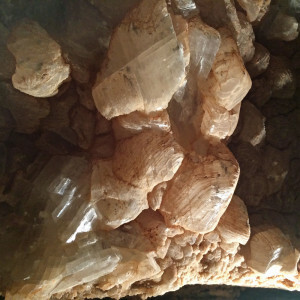 Sadly, it was just calcite. Still, they made the most of it, adorning the central room of what is now the CCC Museum on the surface with the minerals, making a glittering display in the firelight. 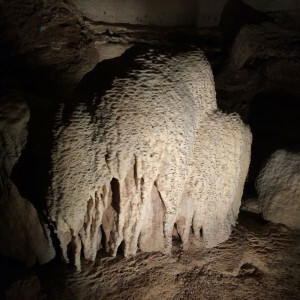 In the Queen's Throneroom, we learned about living stone and how its growth is stopped by the oil on our hands — something the prohibition-era speakeasy partygoers didn't know when they perched their girlfriends on the Queen's Throne to have their photos taken. We also learned that, since a kitchen would fill the cavern with smoke, the speakeasy's waiters rode an elevator up and down to a kitchen on the surface to serve meals. 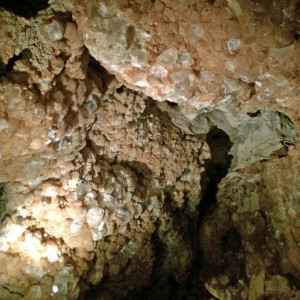 We discovered that the Indian Council Room, the largest space in the cavern, is known to have been used by the local Comanche. A tribewoman's body was found on a ledge high above us. Her body wasn't the only one found inside: a Civil War soldier was discovered near an area where bat guano was harvested for its nitrate to make gun powder. Bat guano seemed to bring out the worst in everyone in this cave: we grimaced at the sight of an 80+ year old piece of chewing gum enjoyed day after day by a guano-shoveling CCC member. The gum was left to hang from the wall after his last day on the job. 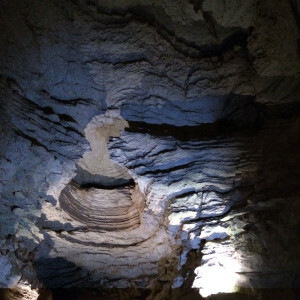 We learned about how the cave was formed by a river, leaving it without many stalactite and stalagmite formations that traditionally adorn caverns. 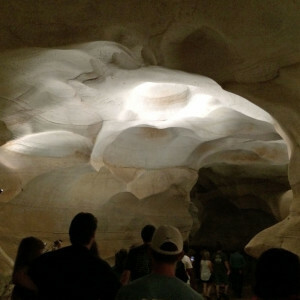 Instead, the walls are smooth in many places, and domes in the ceiling have been left from swirling water currents. One of these domes is near the section of the cavern that was reserved as Lyndon B. Johnson's personal fallout shelter should he have ever needed to use it. Our tour guide called it LBJ's personal capital building dome. 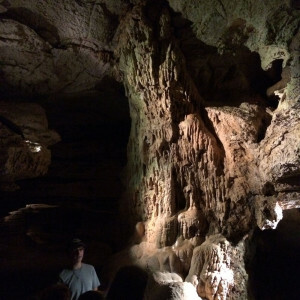 We learned the cavern is supposedly haunted by several characters. And while this may just be a ploy to get visitors to spend more cash on the park's haunted tour, ghosts undoubtedly do make for good stories. We're a part of the cavern's story now, too — the story of curious tourists exploring its depths, attending concerts in the Indian Council Room and spelunking in the "basement" level. I wonder what the next stage of the Cavern's story will be. What outdoor site or park do you love for its stories, and why? Tell me in the comments.